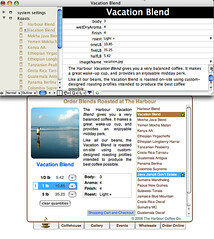 Here is a preview of the shopping cart system I have developed for Harbour Coffee Co., a specialty coffeehouse and coffee roaster in Hershey, PA.
For the last 2.5 years, I have been threatening to use Tinderbox, from Eastgate Systems, to manage a PHP database-driven website. This site will be the first example. If my client chooses to use the Tinderbox solution, he will be able to manage the regular site's content -- blogs, information, etc...-- and the online store from the same easy interface. I didn't have to write an administration tool. Tinderbox works fine. Without an RDMS, I have one less point of failure. Since I talk to Paypal, I didn't need code to process credit cards. This whole solution took about 10 hours to develop. Since I used Tinderbox, most of my work went into user interface design rather than backend code.